I'm super excited to share that Delainey and I are now paid Brand Ambassador for Gerber Childrenswear! What does that mean exactly? It is just is a fancy way of saying this post is sponsored, as always all opinions expressed below are mine alone! As you know, I have quiet the fashionista on my hands, she loves to dress up and one of her first words was "bow"... so it's safe to say she's a little diva. WHO does she get that from? Don't look at me! HA. While we're constantly loving on our favorite brands, Gerber is one that we just keep coming back to. Maybe it's the fact that it's a brand that's been around for generations, so there's a bit of nostalgia while I slip a bodysuit on her that's the same brand I wore when I was little? Maybe we love Gerber Childrenswear so much because they offer all the basics we'll need, as well as fun coordinated sets like the new ones you can find at Walmart...? I think it's safe to say, we both like Gerber apparel because these bodysuits make it easy to complete the inevitable diaper changes through out the day with higher-in-the-front snaps. Plus, the ability to slip these on and off her quickly is a huge bonus! I just know I love that she's snug, safe, and comfortable in her Gerber bodysuits no matter what we're doing. 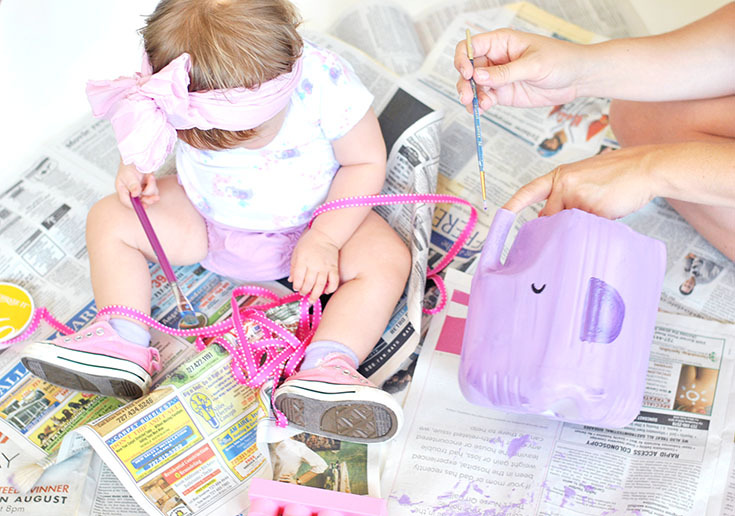 Running errands, gardening in the backyard, or even if we are just having a cozy day around the house crafting... we throw her in a Gerber bodysuit with some matching accessories and she's all set and still perfectly stylish for a one year old. 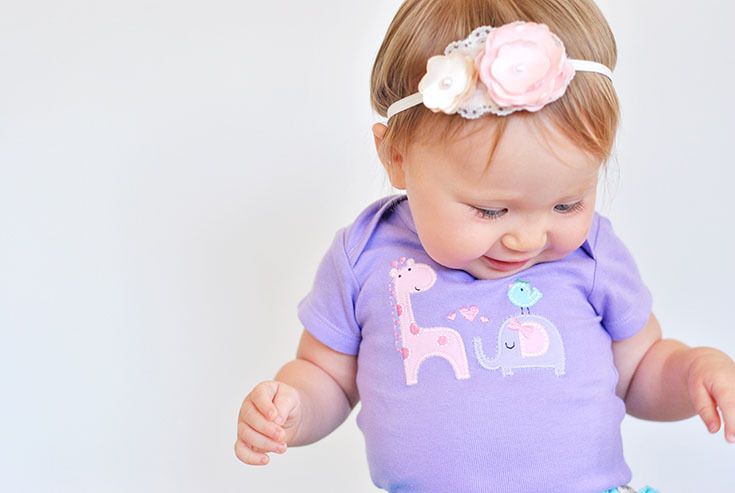 We love our new set of Gerber Childrenswear bodysuits and socks so much, we dedicated our recent day of crafting to the adorable little elephant design on our favorite suit of the bunch. 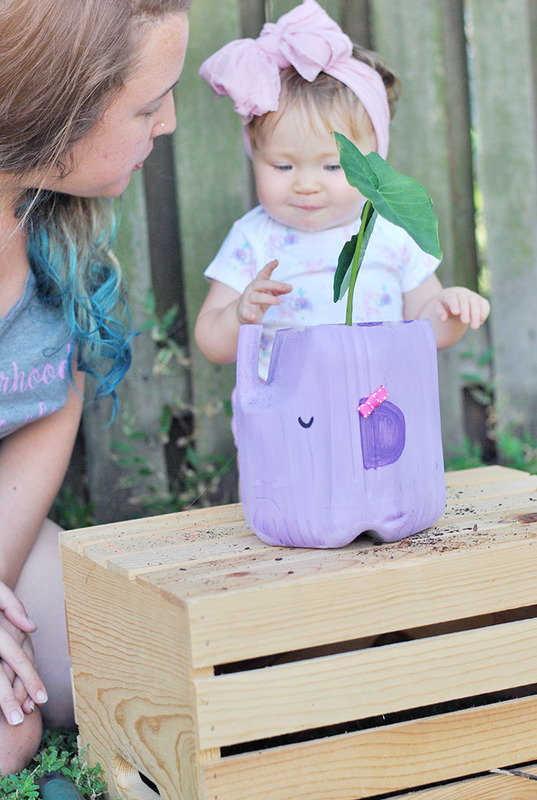 Next time maybe we'll attempt her giraffe friend, but for now, here's the deets on how we made this adorable little ele-friend planter inspired by our Gerber bodysuits. 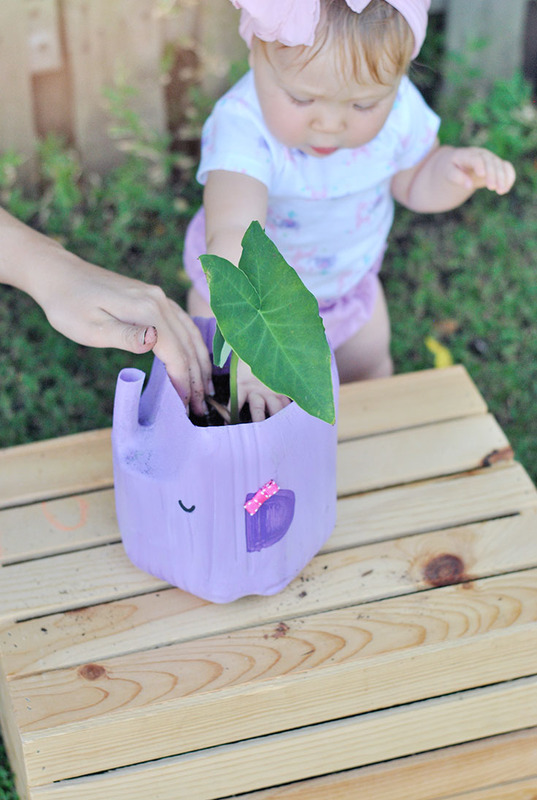 You'll start this project by laying down newspaper, to protect your surface from a toddler with a paintbrush. Next, you'll want to cut the top portion of the jug off, leaving the handle of the jug to play as the trunk of the elephant. 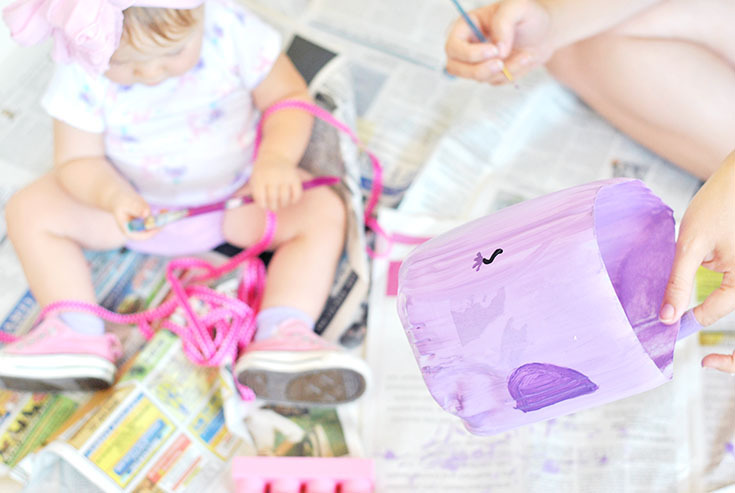 Next you'll want to paint the entire jug one color, in a thin even coat - we used a light purple. Let this dry. 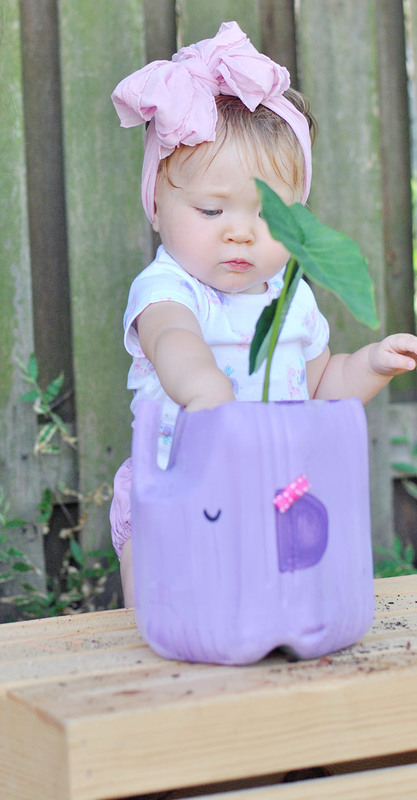 Then add on the details like the D on both sides of the "body" of the elephant to make the ears in a coordinating color, we used a darker purple to match our Gerber bodysuit.. and then add a little half circle for the eyes! Don't forget to scribble on a little tail too! Next you'll glue two pieces of ribbon together, wrap a smaller piece around that, and glue the ribbon to the ears of the elephant. 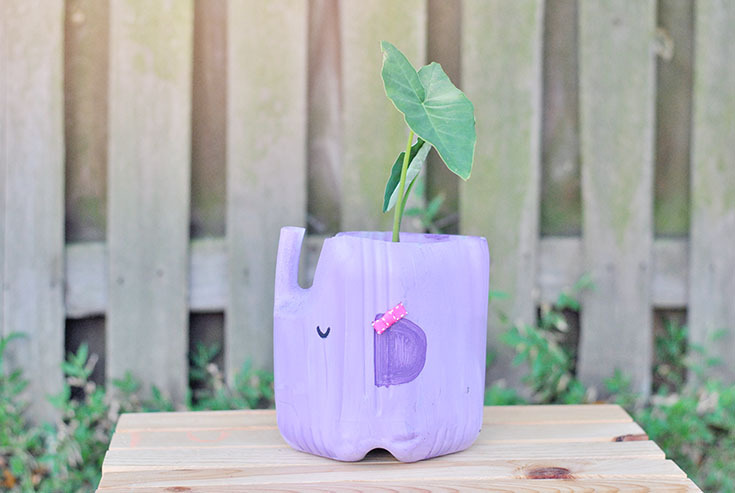 Once it's all dry and ready, go ahead and plant your little seedling (or seed) and your little elephant planter is good to go! 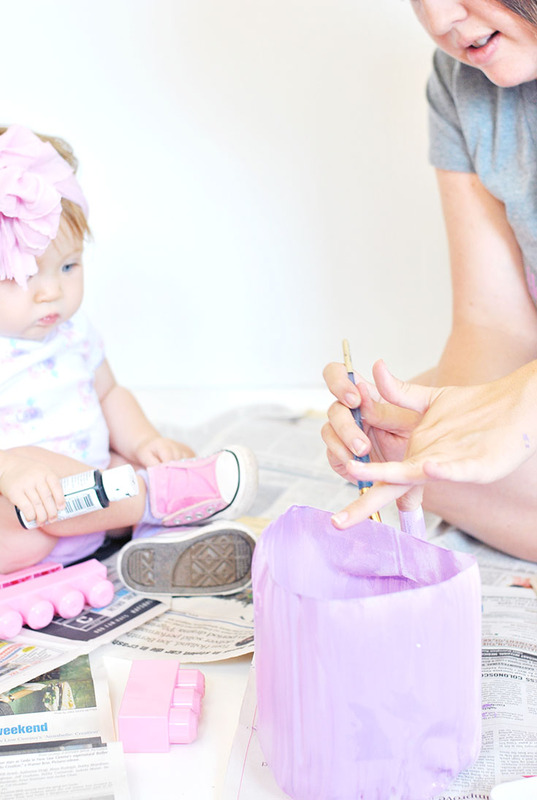 It's that easy to get crafty with your toddler and you better believe they will have a blast... well, at least Delainey did! Oh yeah... and once your done crafting up an elephant planter friend, just a reminder: you don't want to forget to check out Gerber's coordinated baby apparel collection at Walmart! Whether you're looking for your little one or an expectant mama in your life, I guarantee the comfortable, adorable and affordable items in their apparel collection are perfect for any occasion!